Apart from being impossible to achieve overnight, you cannot build an aesthetic, lean, and powerful physique half-heartedly. As such, you must put in some hard work to obtain the desired body frame as well as physical fitness. Although we know the importance of exercise and diet when it comes to getting in shape, a lot of us tend to underestimate their effects. Most people struggle with exercises because they do not know the workouts to perform and the reason for each exercise. While compound exercises are effective when it comes to building muscles, there are so many forms to choose from, and knowing which one to pick might pose a challenge. Fortunately, compound exercises do not need free weight seeing as you can perform several forms using nothing but your body weight for resistance. Pull-ups are one of the most convenient and effective forms of compound exercises. The knees may be bent if the bar isn’t high enough or by choice, and it might reduce pendulum-type swinging. As a type of compound exercise, pull ups use an individual’s own body weight for resistance. Although pull-ups are primarily designed to target the back, they also target arm, deltoid, and core muscles. Because pull ups add mass, width, and definition to lower, middle, and upper back muscles, many professional bodybuilders consider them as the definitive exercise for the back. There are several variations and alternatives to the basic technique described above regardless of the fact that as a vertical pulling motion, it is the same muscle used for the most part. The main difference among the various alternatives lies in which muscles are being targeted as well as the intensity of the muscle contraction. As one on the best beginner exercises, all you need to do for this particular pull up variation is pull up and hold your body weight at the top in a static position. For those struggling to get started with one complete pull-up repetition, this variation is bound to help you develop strength. You can also incorporate a small jump into the hold to make this exercise easier. By placing your hands wide and then pulling your body up to the bar, you engage the latissimus dorsi muscle more. The wide grip pull up is significantly more challenging compared to the pull ups that involved hands positioned closer to each other. Although traditional pull ups are strict and do not utilize momentum to help pull your body up, the kipping pull up defies this rule and uses momentum to propel the body. As a highly mechanical movement, nailing down this technique is a little bit tricky. It is, however, an excellent and brutal anaerobic exercise for the upper body and once perfected, kipping pull ups are great for building a powerful grip, strong lats, and broad shoulders. How to do it: With an overhand grip and hands shoulder-width apart, pull your legs back such that your body forms a backward arc before forcefully pulling your legs forward and swinging your body up to the bar while taking advantage of the momentum. You can repeat the procedure for the desired number of repetitions. You will most likely perform more reps than you ever did with traditional pull-ups. By pulling your body up and over to one side and then across the bar to the other end before you resume your starting position, you load only one side with weight. Compared to a traditional pull-up, this type of pull up exerts more weight on your muscles. Around-the-world pull ups emphasize one arm over the other, particularly in the pull’s initial phase. It is, therefore, a worthy segue to the one-arm pull-up. How to do it: With an overhand grip and hands 6-12 inches wider than shoulder-width, pull your body up towards your right side before pulling it across the bar to your left, and then drop back down to the starting position. You can change direction while repeating the procedure for the desired number of repetitions. Because your arms work overtime to pull your body vertically, a close-grip pull up emphasizes the muscles in your arms. However, you still activate the lower and middle traps, rhomboids, and serratus posterior superior muscles albeit at a significantly less degree compared to the muscles in your arm. How to do it: With an overhand grip and hands slightly less than shoulder-width apart, pull up to the overhead bar in one smooth motion such that at the top of the pull-up, the bar is touching the bottom part of your neck. Lower down until your arms lock while ensuring the movement remains controlled and repeat the same for the desired number of repetitions. The basic idea to perform pull ups is standing underneath a bar capable of bearing your weight, taking an overhand grip slightly wider than the width of your shoulders, and then smoothly pulling yourself up towards the bar, at least until your chin is just higher than the bar. Slowly lower your body and repeat the motion to continue the exercise. » The bodybuilding style, involving bent knees and rounded lower during the exercise. » The tactical style, involving straightened legs held slightly in front of your body as you complete the exercise. Gymnasts and the military often use this type. 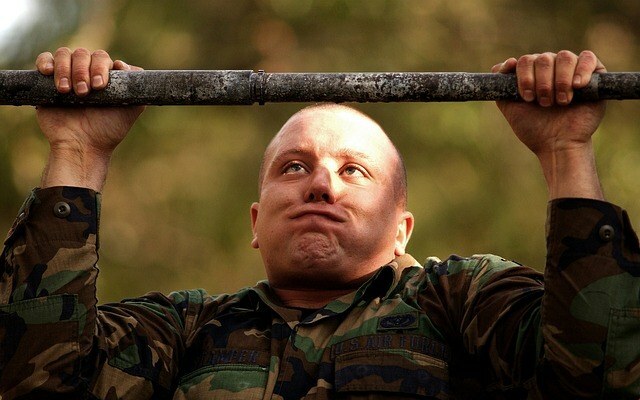 How Many Pull Ups Should the Average Person Be Able To Do? The flexed arm hang refers to holding the chin up at the top of the bar. Setting a solid goal as per your age and performing pull ups until you get the desired result is recommended. All you will have to do is incorporate one of the various variations, which basically means using a different grip. On the other hand, taking an underhand grip narrower than your shoulder-width works more on your biceps. By simply adjusting your grip and the width in-between, you can work different muscles. As multi-joint exercises, pull ups allow you to work on multiple muscle groups without including any other type of exercise. As a result, you could reap the benefits of a full-body workout by using more than a single muscle group to perform pull ups. When it comes to cardiovascular conditioning, pull ups are quite beneficial, even though we cannot compare them to swimming or jogging. There is no denying the fact that pull ups are tough. As a result, your body has to work very hard, which means increasing your heart rate, using up more energy, and burning more calories. Apart from benefiting from greater cardiovascular conditioning and getting fitter, you will also burn fat more efficiently, which provides a significant advantage if you want to drop a few pounds in the process of getting into shape. Although it is natural for some people to have stronger grips than others, pull-ups could be just what you need if your grip strength is wanting. With this type of exercise, you are basically using your arm to pull up your entire body weight. As such, ensuring your grip strength isn’t going to give out is of uttermost importance. 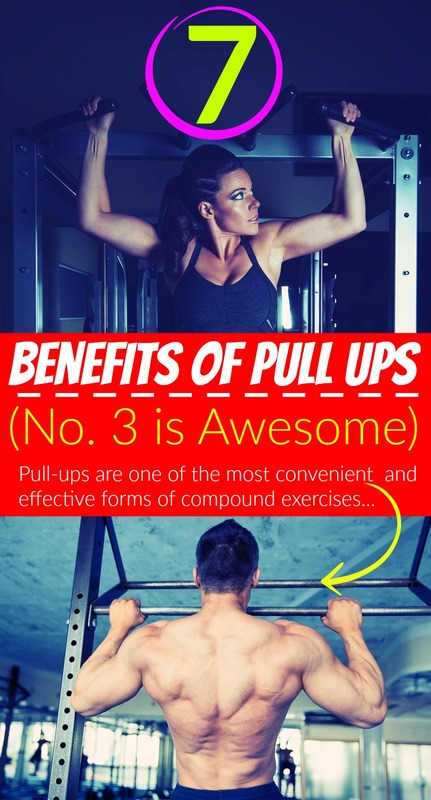 Thanks to the fact that they are rather convenient, pull ups are quite popular as a form of exercise. As long as there is a structurally sound and safe overhead bar to pull yourself up with, you can perform pull up exercises anywhere. As a result, many people perform pull ups when they do not have the equipment necessary for other exercises or when they are in a rush. When it comes to pull ups, you do not need to train in a gym, which is especially ideal if you lack the time. Increasing the intensity of your workouts on a regular basis is one of the secrets to building muscles, getting fit, and achieving a desirable physique. Unlike a lot of exercises, pull ups do not require you to get fancy just to increase the intensity of your workout. You can quickly boost the intensity of your pull ups by hanging a dumbbell from your feet or strapping a weight plate to your waist. Unlike other exercises, you should aim for the highest repetition and not the heaviest weight. For such an improvement, the frequency of performance is vital. Greasing the groove means performing a set of pull ups now and then. Apart from adding mass to the back, building strength, and increasing definition, pull ups target multiple muscle groups all at once. As such, pull ups are undoubtedly one of the most practical and convenient back exercises. Planks vs Sit Ups: Which one is better? How Does Using a Treadmill Help Your Body?